Excellent for the price and location. The lady at the front desk was very helpful. Room has this (one) long pillow, so we had to ask for 2 regular pillows (what two people would use one pillow??). Where to find Cabuenes hotels near an airport? Where can I find hotels in Cabuenes that are near tourist attractions? 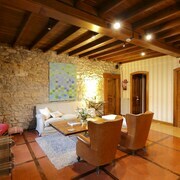 If you are seeking the best places to base yourself in Cabuenes, you're simply spoiled for choice. If you are looking to stay within a 0.1-kilometre (0.06-mile) radius of central Cabuenes, Expedia's comprehensive database contains at least 34 apartments and hotels in that area. 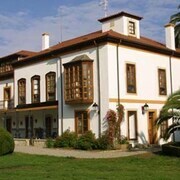 The Hotel Quinta Duro and Hotel Rural Mirador de Deva are some of the most centrally located accommodation options in Cabuenes. 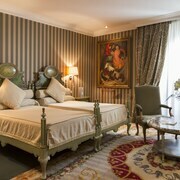 You could also check out the Eurostars Hotel De La Reconquista or the BAL Hotel Spa. The Eurostars Hotel De La Reconquista is situated 25 kilometres (16 miles) from the middle of Cabuenes. The BAL Hotel Spa, is positioned 4 kilometres (2 miles) away. 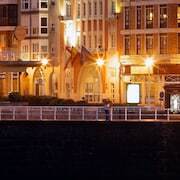 Two more Expedia-listed accommodation options are the Abba Playa Gijon 4s and the Hotel Don Manuel. 6 kilometres (4 miles) away from Cabuenes you'll find Gijon, where you can spend a few hours exploring Plaza Mayor and San Lorenzo Beach. 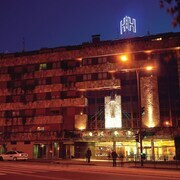 Gijon hotels include the Alcif and Hotel Hernán Cortés. Alternatively, you could stay in Luarca, 75 kilometres (47 miles) to the west of Cabuenes, where you can pick from the Hotel Villa de Luarca and Casa Pacho Apartamentos Rurales. The Senora la Blanca Chapel and Laurca Marina are some of the most popular points of interest to check out when you're in Luarca. Get your sports fix by making a journey to El Molinon, which is 4 kilometres (3 miles) to the northwest of Cabuenes. Those sports fans wanting to find accommodation close to the action can make a choice from the Parador De Gijon or the TRYP Gijón Rey Pelayo Hotel. If you are traveling into or out of Asturias Airport and choose to stay nearby try Palacio de La Magdalena Hotel or Hotel Marqués de la Moral. What are the most popular Cabuenes hotels? 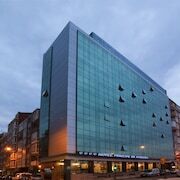 Are there hotels in other cities near Cabuenes? 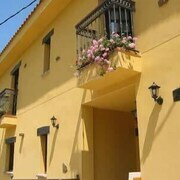 What other types of accommodations are available in Cabuenes? Explore Cabuenes with Expedia.ca’s Travel Guides to find the best flights, cars, holiday packages and more!